The International Federation of Journalists slams the deteriorating situation for journalists in China. 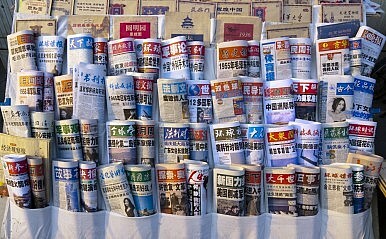 An annual report on press freedom in China published this week by the International Federation of Journalists (IFJ) has slammed the deteriorating situation for journalists working in China, and highlighted the increasingly active role mainland authorities are taking to exert influence on the press in Hong Kong and Macau. “The state of press freedom and freedom of expression in China in 2014 was deplorable,” IFJ Asia-Pacific said in its report, CHINA’s MEDIA WAR: Censorship, Corruption & Control. The SAPPRFT issued directives banning journalists from reporting on “state secrets, commercial secrets, unpublished information, and so on,” and that journalists could not “reproduce, copy or store” such information, or “talk or write to others in private” about it. Beginning in 2014, journalists working in China will be required to pass an exam in order to qualify for press accreditation. The training materials for the exam are said to emphasize government-friendly ideology, and encourage journalists to take on the role of guiding public opinion. Chinese authorities have also tightened their grip on the internet, with the establishment of the Central Internet Security and Informatization Leading Group in February 2014. Although the leading group is ostensibly tasked with formulating China’s cyber security strategy and developing the country into a “cyber power,” subsequent security measures that were rolled out resulted in websites and blogs being shutdown, millions of posts being removed from social media platforms, and scores of arrests without charge, according to the IFJ. Press freedom in Hong Kong, meanwhile, endured a “chilling” 2014. Several journalists in Hong Kong were victims of intimidation and violent assaults, while a number of television, radio, and print outlets struggled with self-censorship due to internal and external pressure. Two leading Hong Kong-based newspapers, Ming Pao and the Hong Kong Economic Journal, were accused of practicing self-censorship, along with Hong Kong’s largest free-to-air television station, TVB, and public broadcaster RTHK. In all cases upper management at these media groups was suspected of intervening in editorial decisions in order to avoid falling foul of authorities in China and Hong Kong – as well as influential advertisers – according to the IFJ. Although mainstream media outlets in Hong Kong are loosely lumped into two camps – “pro-Beijing” and “pro-democracy” – the Occupy Central Movement triggered an unprecedented departure from editorial independence, with many Hong Kong media organizations accused of bias. A survey of the public’s trust in the media by the Chinese University of Hong Kong found that the credibility of the media had fallen to its lowest level since Hong Kong’s return to China in 1997. Robert Sullivan is a Hong Kong-based journalist. He covers energy for Interfax and writes on current affairs in China and Hong Kong. He received his Masters in Asia-Pacific Policy from the University of British Columbia. China's famous political reformer ironically helped pave the way for Xi's current crackdown on dissent. Life Is About to Get Even Harder for Foreign Media in ChinaChina FM’s Reprimanding of Canadian Journalist the Tip of the IcebergXi Wants Chinese Media to Be 'Publicity Fronts' for the CCPBeijing’s Peaceful Evolution ParanoiaIs This Man Responsible for China’s Stock Market Crash?